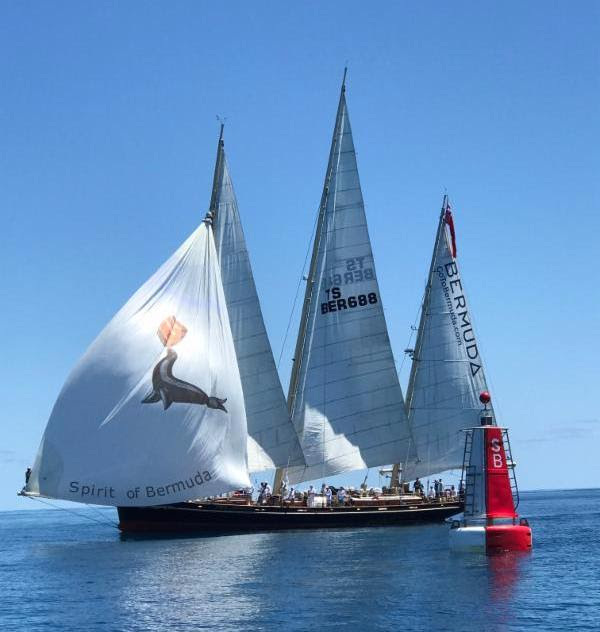 The Spirit of Bermuda has finished the 935 nautical mile Antigua Bermuda Race, crossing the finish line off St David’s at around midday local time today [May 18]. The crew onboard the Spirit of Bermuda include Jeff Bennett, Blair Blakeney, Lindsey Cubbon, Dkembe Dill, James Doughty, Dylan Ferry, Jennifer Gibbons, David Goulbourne, Sandra Harries, Whitney Kirkland, Russell Medway, Myriam Mnasri, Mike Moreland, Patrick Perrett, Harriet Richold, Lamar Samuels, Edward Stovell, Charles Swan and Esmerelda Zanders. There is a difference between a fast light displacement semi planing hull and a full displacement hull, sort of like comparing a powerful tug displacing 10 ft of water to a fast surfboard displacing 3″ of water in the quest for speed. Modern sailboat designs these days tends to lean towards light or semi displacement hull in the quest for boat speed were full displacement hull give a slower and more comfortable ride. People sailing oceans at night can be compared to climbing the tallest mountains , which ,takes determination and courage. Sailing ,builds team work; character; confidence and a deep respect for mother nature. Congratulations to ” Spirit of Bermuda ” and all who sail in her, as you, have achieved the impossible dream as you brought her home safely and that is all we ask.